2 posts in 2 days .... your probably wondering if thats even possible. I know I am. But I am going to find the time to catch up with my posts from now on. So, thank you for sticking around and being so patient. You will find more regular posts here from now on, compared to the last couple of months. I have been cooking and baking a whole lot, I just haven't had the time to share it with you. But fingers crossed, thats going to change. Okay, so yesterday, I shared with you a treat that I've only recently learned to make, the humble cruchy vadas or deep friend lentil fritters. 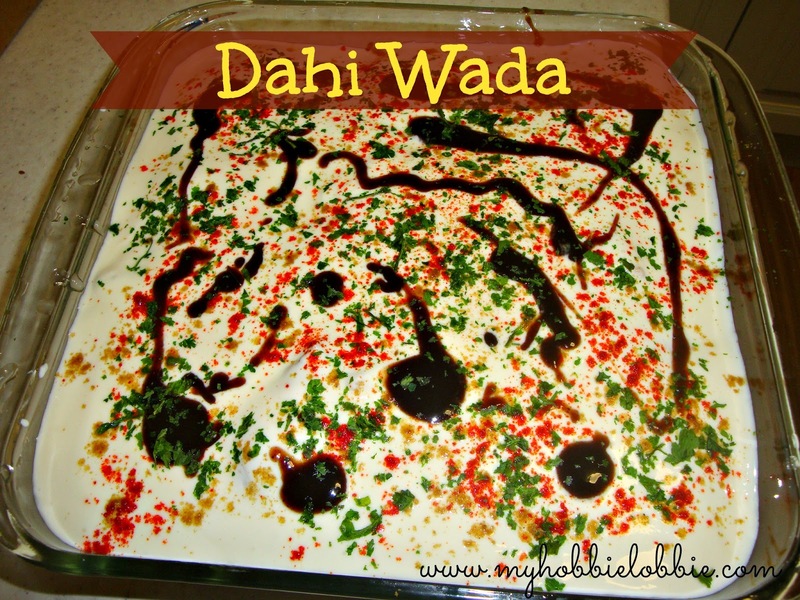 We enjoyed these so much, I decided to try and use these in another popular Indian treat, the Dahi wada. (Dahi-meaning yogurt and wada - fritters). Essentially, Dahi wadas are little fritters dunked in some seasoned yogurt with a little flavoring to take it to that next level of yum. I know that the dahi wada purists will frown on my method, but it works for me and it is really delicious. Delicious enough to have converted an aunt of mine who was visiting. She never has dahi wadas when it is up for grabs at parties, buffets or at Indian restaurants because of a couple of unpleasant experiences she's had previously. She claimed that these looked fantastic and she couldn't go past it without trying some and turns out she loved it. I even gave her some to take home and enjoy later. What I did was, made up one batch of the the lentil fritters. We had half of it with some chutney and I used the other half to make these dahi wadas. This is not an exact recipe, but some guidelines. You need to tweak it to suit your liking. Its a little sweet, a little savory and a little tangy all at the same time. 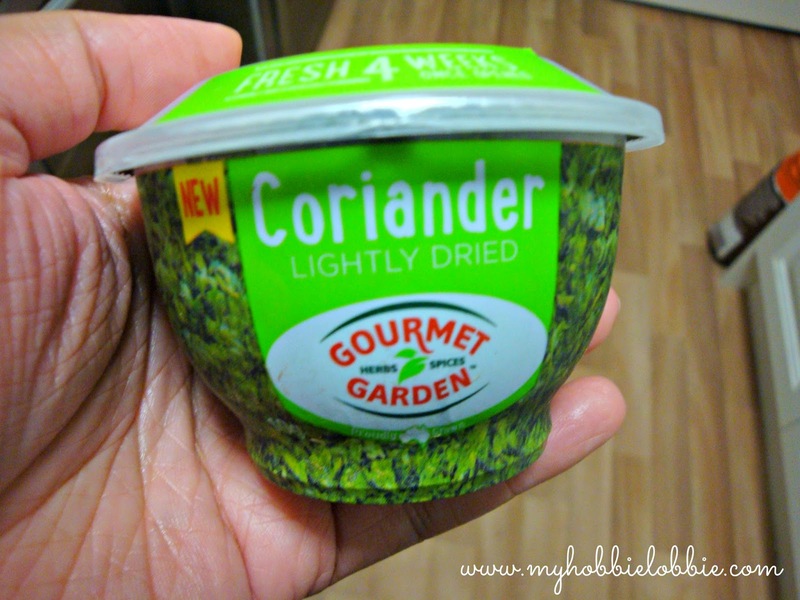 In this instance, I used some store bought freeze dried coriander since I could not get my hands on any fresh coriander. But use fresh if you can. I'm happy to have found this little treasure pot. I keep one at hand for times when I can't find the fresh stuff. 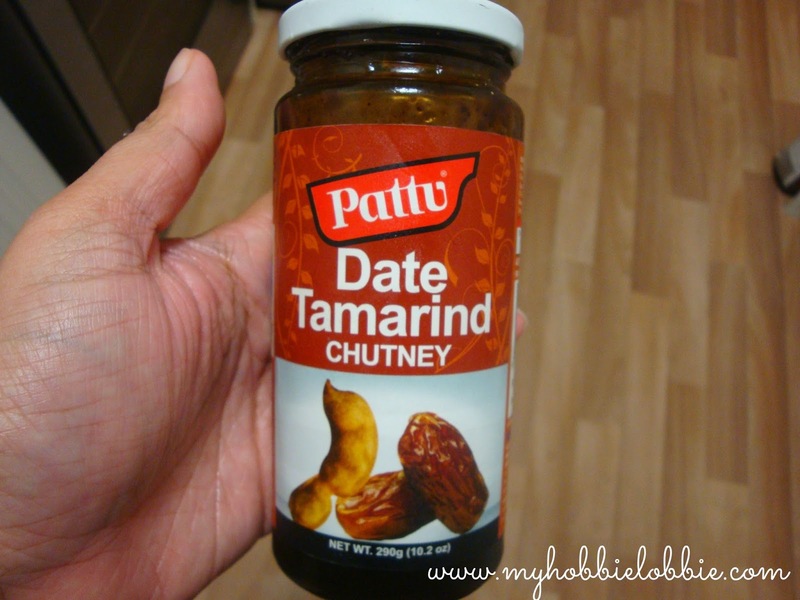 Another time saver is this bottled Date and Tamarind Chutney, found at any Indian store in Sydney. Again, I'd prefer to use a home made variant, which is tastier and has better consistency, but if you're in a pinch, this will work fine. If you'd like to make your own little jar at home, you can find the recipe here - Tamarind and Date Chutney. Now on to the Dahi wada. Here's what the end result will look like - delish! Take hot water in a large bowl. Dunk the warm wadas in the water and keep it submerged in the water for a little while (1/2 a minute or so) till it has absorbed a fair bit of water. Place the soaked wada between the palms of both hands and press firmly to drain all the water out. (We do this to get rid of any excess oil as well as to make the wada more absorbent - that way it takes in more flavor of the yogurt.) Continue with the rest of the fritters. Place in the serving dish or platter in a single layer. In a large bow, beat the yogurt. Add salt to taste and some sugar. It should lightly sweeten the yogurt but not make it too sweet. Add a splash of water and whisk the yogurt. You need to add the water gradually till you get a thick pouring consistency. (Somewhat like a pouring custard consistency.) In all, you need enough yogurt to cover the fritters completely and generously. Pour this yogurt over the fritters till you have covered them well. Sprinkle some red chilly powder, cumin powder and drizzle some Tamarind Date Chutney and Mint Chutney (not used here but can be added if desired) over. Garnish with a sprinkling of chopped coriander. Refrigerate for a little while, atleast half an hour to let the flavors build and then serve chilled. This makes a nice refreshing snack for a warm summers day, or if you are like me, its perfect any day of the year. NOTE: This is NOT a sponsored post. I haven't been approached or compensated by Gourmet Garden or Pattu or any stores that stock them. These are just products that I happen to be using at the moment and work well for me.